Vince McMahon is undoubtedly the greatest wrestling promoter that has ever graced this industry, with his billion dollar company transcending all elements of greatness in sports entertainment. It's undeniable that Mr. McMahon has played an influential role in altering the entire landscape of the business we all so dearly love, but some of his creative decisions have caught people cold throughout the years. Since WWE has transitioned from being a mere professional wrestling promotion to a global phenomenon, the company has had some of the most talented performers in the entire industry like A.J. Styles, Brock Lesnar, Ronda Rousey, Becky Lynch, and Seth Rollins. The company's most recent big event was WrestleMania 35 which eventually ended up being one of the greatest visual extravaganza's ever put forth by the billion-dollar corporation supervised by Vince McMahon. A significant element why the company is so successful is because they have enjoyed tremendous mainstream attention throughout the years, and since we are talking of mainstream media attention here, there are some major headlines doing the rounds. The name that is gravitating a lot of attraction is Sasha Banks. The former Raw Women's Champion is making waves all over the wrestling world with speculations of her leaving WWE running rampant. Furthermore, The Boss unfollowing WWE and subsequently following AEW on Twitter has garnered a lot of reactions on social media. Legions in the WWE Universe are closely monitoring the situation with The Boss now becoming a major subject of debate in the internet wrestling community. 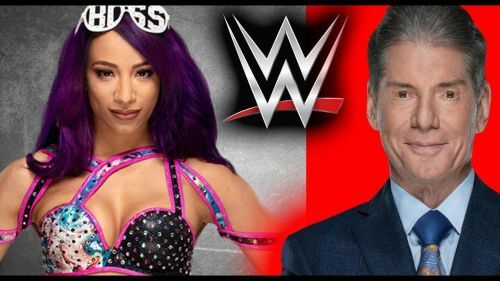 With the Superstar Shake-Up just around the horizon, will Vince McMahon make a legitimate decision on Monday Night Raw and how he moves ahead with the Sasha Banks situation or will he offer her something she can't refuse? Let's dive deep into this situation. With Ronda Rousey breaking the fourth wall and going off the script after turning heel, one thing has become very certain that the company will be willing to go the distance in order to ascend the credibility of a feud. Considering that she constantly addressed WWE of being fake, an element of realism could be added to Sasha Banks' ongoing situation as well before successfully playing it out on our screens. Whilst I always take CM Punk as a reference to get things over here, a Superstar coming out in public and blatantly addressing his/her dissatisfaction with the establishment could really work out fine in the longer run. There's no denying that Sasha Banks is gravitating a lot of eye balls on social media and with the rumors of her jumping ship to AEW becoming a hot debate, Vince could use this momentum into delivering something productive. Playing out the storyline during the Superstar Shake-Up would be decisive in igniting more eyes on the women's division and ultimately help Banks reach the level that she certainly deserves.